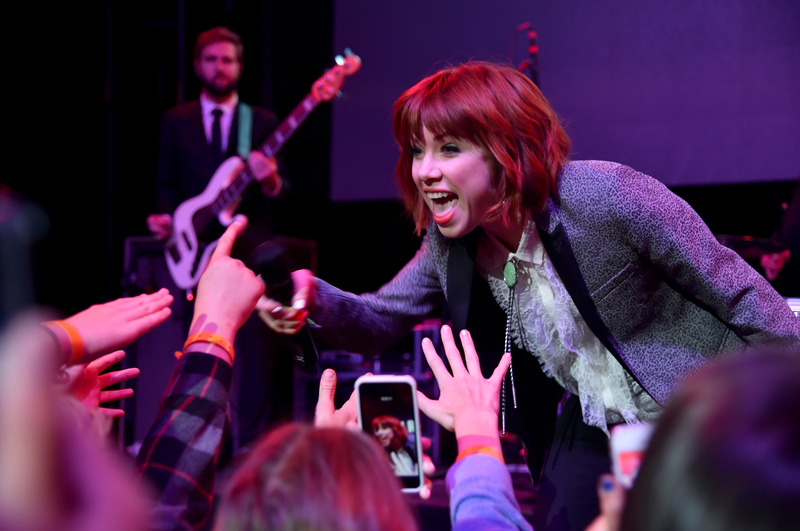 Last Friday, "Call Me Maybe" hit-maker Carly Rae Jepsen premiered three new songs from her upcoming album, E·MO·TION, during a concert in Beijing: "Emotion," "Black Heart," and "Run Away With Me." All three tunes sound like they were inspired by '80s pop (a genre which Jepsen has said inspired her new LP), but "Run Away With Me" stands out. To my ears, it has the most mainstream hit potential of the trio. And when you consider that Jepsen’s current single, "I Really Like You," just barely squeaked into the top 40 on the Billboard Hot 100 chart last week (a full month after its release), it becomes clear that she could really use a hit right now. Based on what we've heard from E·MO·TION so far, I think "Run Away With Me" would make a fantastic follow-up offering. Can't you just imagine yourself driving a convertible 80 miles per hour down an open road on a warm summer day, blasting "Run Away With Me" as loud as the stereo will allow? I know I can. Check out Jepsen's performances of "Emotion" and "Black Heart" below. Here's to hoping E·MO·TION arrives soon — I'm not sure how much longer I can wait!